Providencia Island, which is closer to Nicaragua but belongs to Colombia, is a beautiful atoll home to white-sand palm tree-lined beaches, lush jungly hills, around 5000 people who mainly speak a unique form of English Creole, and a handful of small hotels and guesthouses in Caribbean-style wooden buildings the colour of fruit sorbet ice creams. There’s just one 17-kilometre road around the island (the best way to get around the island is by renting a golf cart) and not a single resort. It’s so under the radar that not even that many Colombians know about it. The island is surrounded by the world’s third largest barrier reef, so the snorkelling and diving is amazing (I did my five-day open water PADI certification with Pichi – the most chilled guy in the world – at Felipe’s Dive Shop, and dived with sharks every day). Apart getting into the warm water to dive or swim, there’s not much else to do on Providencia Island, other than drinking pina coladas out of coconuts, swaying on hammocks, dancing to Bob Marley being played by beachside reggae bars, and watching the sunset each day. It’s honestly one of the most laidback, relaxing, friendly places I’ve ever been to. My favourite spots were Cafe Studio, a little restaurant near Freshwater Bay that serves the most amazing crab stew with coconut rice, tamarind juices and coconut pie (which I still crave) and Roland’s Reggae Bar at Manzanillo Bay, where you can sit in old wooden boats and drink cold beer, with the ocean four steps away, or swing into the sea on buoys hanging from palm trees. I couldn’t get enough of the crab pizza at the Blue Coral Pizzeria, and the toasted crab sandwiches and homemade lemonade at Miss Elma’s, right on the beach in Freshwater Bay. I loved hiring a golf cart for the day and exploring every little beach on the island. By end of nine sunshine-filled, wi-fi and stress free, heart-rate slowingly relaxing days on Providencia Island, we felt like we knew half the island (including its packs of stray dogs). People hooted at us from scooters and the back of pick up trucks as we strolled along the road. It didn’t take long to feel part of this tiny island community – it’s easy to see why many of the people who end up here never want to leave. 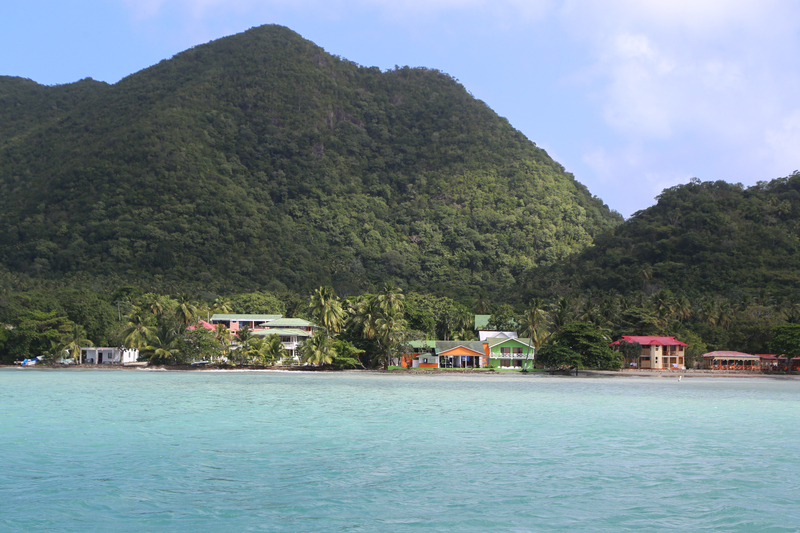 There are only two ways to get to Providencia – by boat or plane from nearby San Andres Island. The boat ride is a seasickness-inducing one, and trips can be cancelled if the sea is rough, so it’s best to fly (flights don’t cost that much more). The most expensive hotel on the island, Deep Blue, has a lovely view but it doesn’t have a beach and it’s on the eastern side of the island, so you’ll miss out on sunsets. We stayed at Sol Caribe, which was overpriced but had a great location on the beachfront of Freshwater Bay (which, having driven around the island, I think is the best area to stay in, with a great dive shop, restaurants, golf cart rental place and a few hotel options). We also stayed at Posada Mr Mac – a very basic little guesthouse in Freshwater Bay. The room was cramped and stuffy, but super cheap – and it had a pretty unbeatable setting right on the water, with hammocks stretched across the deck, so you could sway gently watching the sunset.